Model United Nations creates realistic simulations of the United Nations. Because of this we continually seek to find new information about the UN, its member states and the topics discussed to perform our best at the conference. As the SIUC affiliate of the American Model United Nations Inc. (AMUN) and the Midwest Model United Nations (MMUN) we attend annual conferences and compete against other universities. The Paul Simon Public Policy Institute is partnering with a team of 11 students to raise money and compete in MMUN, February 22-25 at the Sheraton in St. Louis. We prepare for our conference by studying and researching our designated country which allows us to represent our countries to the best our abilities. All funds raised through this campaign will help pay for the cost of travel, lodging, and conference fees. In the past, we have represented Qatar, Finland, Lithuania, Egypt, Iran, Luxembourg, Cyprus, and Algeria. Last semester, Fall 2016, at AMUN we represented the countries of Poland and Vietnam. This semester, Spring 2017, at MMUN we will be representing Greece. 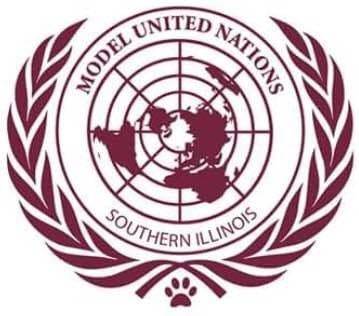 The Model United Nations chapter at SIU Carbondale aims at developing current students interested in the field of international relations into future global leaders. We strive to educate ourselves and inform other students on the current goals and missions of the United Nations; in regards to international security, human rights, nation-building, peace-keeping, and all things related to promoting human dignity for all peoples in all places. It is in this mission that we hope to build compassionate, active students that will continue to engage with people across all cultures with the utmost respect and understanding. Pays for gas for students to travel to our conference. Pays for a student's delegate fee. Pays for delegation fee or a hotel room for a night. Pays for all of our parking costs.